Your life will be easier: when trying to use Principal Component Analysis. How: To compress a higher dimension vector to a lower one. A lossy compression (might loss information). Helps to save memory and computational complexity. I would explain it from the perspective of matrices. Suppose there is a point = [3,2,5], make a projection of the point on the vector . That is , we use the number 5.65 to represent the point [3,2,5]. We successfully reduced the 3-dimension vector to a single number (1-dimension). AfterPCA, we could get a new Matrix , a compressed matrix. 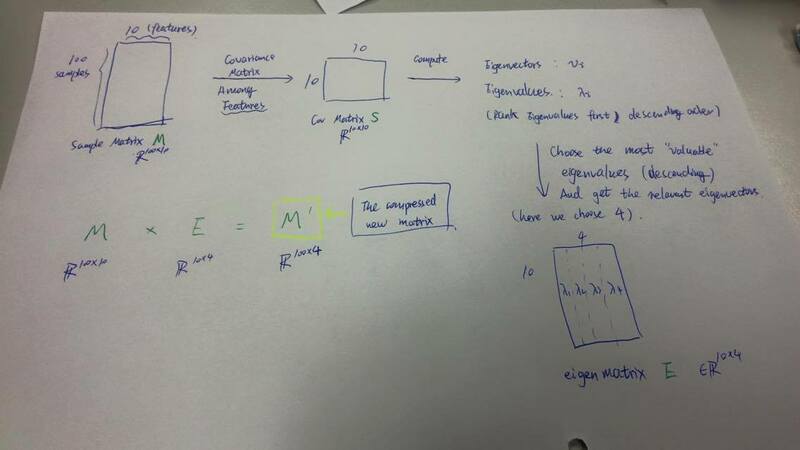 If you are familiar with ML, you can treat matrix E as a “classifier”. When comes the new training dataset, here we say only 2 records, which can be represented by a matrix T, in the dimension of 2 times 10. So next step is, you apply this “classifier” to the training data: , you will get a final result. Numpy is powerful when doing matrices’ processing. lol I can not image how Java will be if I were to define a matrix, probably arraylist and arraylist. Besides, building real word models makes everything to be easy. Forget about the objects and just do matrix multiplications.Btw, GPU is quite good doing that job. Think of an image, it can be seen as a matrix A (composed of pixels). Use PCA to get the eigenmatrix E, then get a compressed matrix.PCA Eigenface is popular among facial recognition jobs provided by OpenCV. The function cvEigenDecomposite() is used to get a projection on the dimension of n.Note it only happens in the training process. I did not try it by myself, but I guess it would be interesting. Life will be easier if you simplify any problems, try to focus on the principal components in your life, which are really matters.